A pair of angelic Pearl 12 inch taper candlesticks, made with 100% pure beeswax. 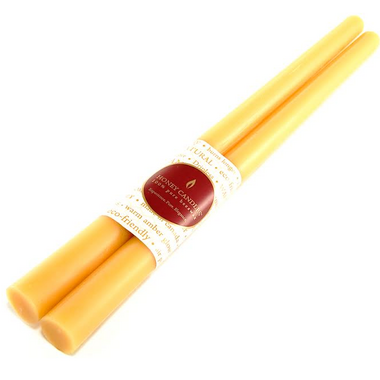 Popular at the dinner table and every celebratory occasion, Honey Candles beeswax tapers are long-lasting, burn with a warm amber glow and produce a soft honey aroma that you'll love! Beeswax candles are a fairly recent addition to my home but have quickly become a staple. Honey Candles in particular are well-made, and their tapers are longer than those of other producers. The honey scent is subtler than I personally like (some local farms have beeswax that is far sweeter) but overall they're a great candle, and preferable to alternatives.